I was sitting in the waiting area at the Break Room, a Sandy Springs-based business that for between $20 and $100 will dress you in protective gear, give you a bunch of breakables—think glasses, dishes, and electronics—and then give you 15 minutes in a safe, low-lit room to bash that stuff to bits with bats, crowbars, golf clubs, and sledgehammers. “Yes,” I said to the man, who had stopped to talk to me after checking out the Escape Room game across the hall. 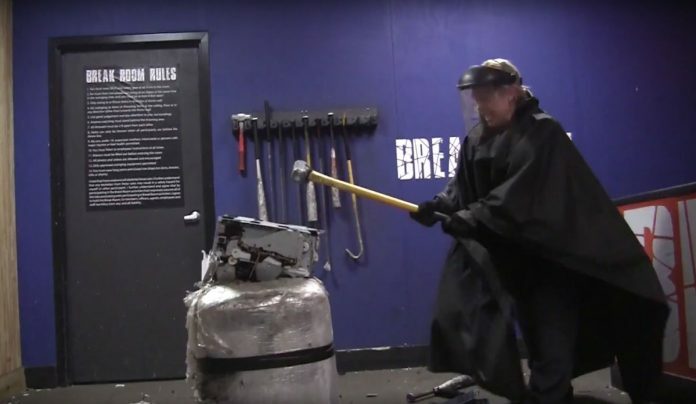 Anger rooms are growing in popularity as a way for people to release tension and feel catharsis without hurting themselves or others. We all know that going a few rounds on a punching bag can have an eventual calming effect. Hit your pillow, I tell my seven-year-old kid when he wants to wallop his little brother. And hey, remember how Kanye West used to yell at the world with bizarre tweets about beef-flavored pineapples, khaki cargo shorts, and fonts? And then he disappeared from Twitter entirely? I think maybe it’s because he reportedly now has a rage room where he can tantrum in private, beating the crap out of dishware, photographs, and CDs. I’m not sure why this man was messing with me. Didn’t I just tell him I wanted to punch someone in the face? Luckily it was my turn to go inside the Break Room and get to work. The attendant walked me into a side room that looked like it was maintained by a doomsday prepper with an abiding love for ugly ceramics and electronics. She picked several items off the shelves and put them in a bucket, then gave me the opportunity to choose one machine. I saw a VCR, even a typewriter, but I knew from the start what I wanted: an inkjet printer. They had one that looked very much like mine at home. I hated that printer with the heat of 1,000 suns. I’d dreamed of going all Goodfellas on it, like those poor schlubs did in Office Space. Now I’d have the chance to attack its twin. This was going to be satisfying. I put on rubber shoe covers, gloves, a chest protector, a giant poncho, and a face shield, then waddled into the Break Room itself. As instructed, I plugged my iPhone into the speakers and cued up some screamy music. Then the attendant shut the door and announced to me, over the loudspeaker, that my 15 minutes had begun. And I went to town—smashing dishes, glasses, bottles, ceramic discs, and the printer. I used the heavy sledgehammer on that one, swinging it over and over again until I was a sweaty, giddy mess. When it was all over, I checked my heart monitor, to see if my spree had burned many calories, and indeed it had: about 188 in a 15-minute session. That’s more than you’d typically burn in 15 minutes of racquetball, backpacking, cross-country skiing, or very light jogging. And when’s the last time cross-country skiing obliterated your road rage? Or a little hike made you feel like pumping your fists and screaming the lyrics of “Eye of the Tiger?” Does a light jog, as slow as a shuffle, make you feel like a gladiator? At the end of my session in the Break Room, I surveyed the damage I’d done — the floor littered with shattered glasses, crushed cups, broken bottles, and the electronic guts of that printer—and I felt good. Pleased. Calmed. Utterly triumphant, and ready for whatever stress would come my way that week. Even from my awful printer. Next time, I’ll bring it with me.